New t-shirt design in red, khaki and new colour: military green (bottom). As some readers may be aware, there is likely to be a labour dispute between the Canadian Union of Postal Workers (CUPW) and Canada Post beginning as early as July 2, 2016. In the event of a strike or lock out it will not be possible to mail our t-shirts (private couriers are too expensive). So if you proceed to order a shirt it is uncertain how long mail delivery will be delayed. If a shirt is ordered we will ship it as soon as the labour dispute ends, or you can simply wait to place your order until after mail delivery resumes. 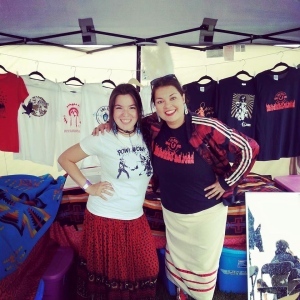 Eruoma Awashish (right) with Innu poet Natasha Kanape Fontaine, selling t-shirts on the powwow trail. Powwow fans in Quebec were surprised and intrigued this summer by the original T-shirt design sold at a tiny kiosk by visual artist Eruoma Awashish. “I want one,” said a man with a crooked smile, at the powwow in the Innu community of Mashteuiatsh, Quebec. He was looking at a T-shirt with an original design made by the Atikamekw First Nations artist. 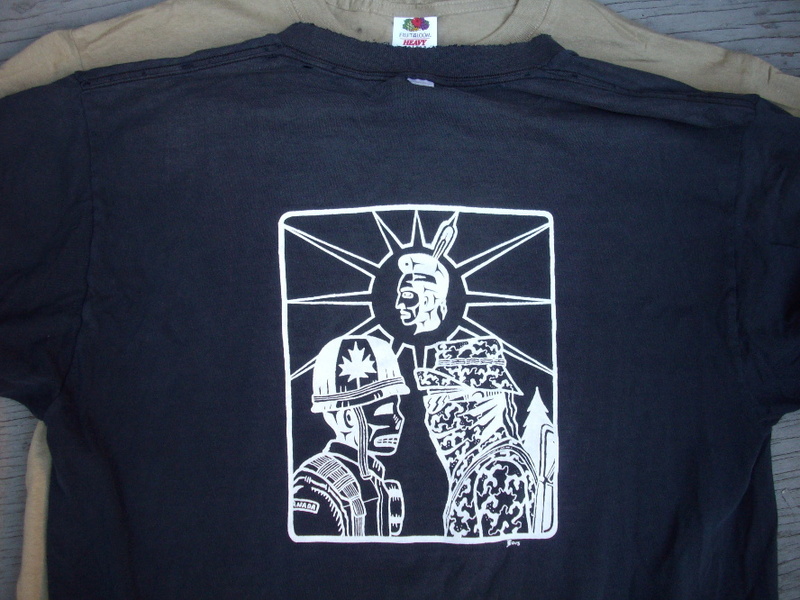 It is an iconic image of a Mohawk warrior and a Canadian soldier during the Kanienkehaka resistance in Kanehsatake, or Oka crisis, in 1990.